eSail will help you develop your skills with races, steering challenges, anchoring, ‘know your boat’ challenges and more. Receive gold, silver or bronze medals and see your results to the eSail leaderboards. 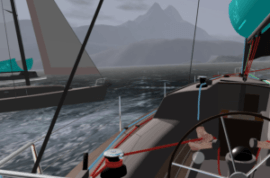 With eSail races you pit your skills against ‘computer skippered’ boats without having to worry about all the rules and regulations of a real sailing regatta. 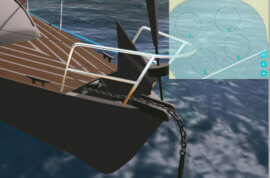 You will become skilled at race tactics, tacking, gybing and trimming the sails including using the mainsheet, jib sheets and kicker (boom vang). It’s all about throttle control! 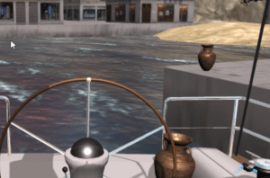 You need to get close enough to click on your prize without drifting into the jetty or quay. And make sure you are not going too fast when you grab your vase or it will end up smashed on the deck! 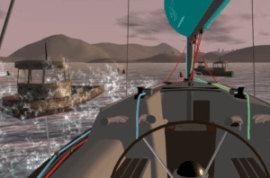 Steer between the red and green buoys and keep your speed up for maximum points. But be careful of the other boats. They should observe collision regulations or ‘Rules of the Road’ but with your boat constantly changing direction they do not always behave as expected! In these challenges you will anchor up, then we check your swing circle by applying different wind directions. You need to take into account the condition of the sea bed and lay down enough anchor chain. 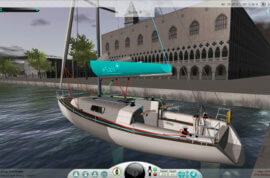 Using our unique boat simulator charting tool, create a course between locations such as Maxwell Marina and Frazer Town via given waypoints. At the end of your voyage make sure you moor up safely (using your fenders) without making contact with the jetty! 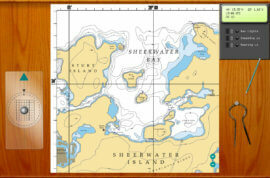 With Live Sailing you weigh anchor, set sail and explore the seas and ocean around the Shearwater islands! Your goal is to collect ‘Points of Interest’ (POIs). If you collect all 13 you achieve ‘Master Explorer’ status. Try this quick quiz to check your sailing knowledge!